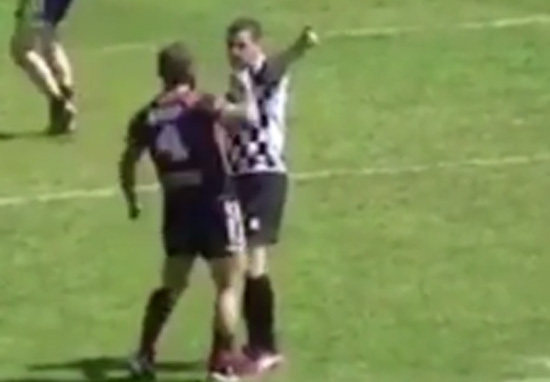 A French rugby league player faces a life-time ban after he sucker-punched a referee after being given a yellow card. Footage of the shocking act of violence emerged online showing the Saint-Esteve – a feeder club to Super League’s Catalan Dragons – player knocking out referee Benjamin Casty (brother Remi Casty). The incident took place during a juniors French Cup match against Toulouse when the player angrily approached Casty and knocked him unconscious with a brutal punch. The player’s rage knew no limits as he began swinging punches at opposition players when they confronted him following the disturbing incident. One Toulouse player tends to the referee while the others join a brawl, indulging the raging number 4. This player had already been suspended four games earlier in the season and I did not want him to play. Casty was diagnosed with cheekbone and jaw injuries and is recovering from the incident. I can’t imagine he’ll have much chance with the Dragons after decking their main star’s brother. …or much chance in Rugby, full stop.